HARRISBURG – In helping to ensure health care coverage for children across the 110th District and throughout Pennsylvania, Rep. Tina Pickett (R-Bradford/Sullivan/Susquehanna) this week voted in favor of legislation to extend the Children’s Health Insurance Program for another two years. The legislation was signed today by Gov. Tom Corbett. Under House Bill 108, the program is extended until Dec. 31, 2015, and the six-month waiting period is eliminated before a child can enroll. CHIP coverage includes quality, comprehensive health insurance coverage for routine doctor visits, prescriptions, dental appointments and eye care, along with immunizations, mental health, durable medical equipment, rehabilitation therapies, home health care and autism-related services. Free CHIP coverage is available to eligible children in households with incomes no greater than 200 percent of the Federal Poverty Level (FPL); low-cost CHIP coverage is available for those with incomes greater than 200 percent but no greater than 300 percent of the FPL; and families with incomes greater than 300 percent of the FPL have the opportunity to purchase coverage by paying the full rate negotiated by the state. Currently, 188,098 children are enrolled in CHIP across the Commonwealth, with 947 in Bradford County, 91 in Sullivan County and 777 in Susquehanna County. Rep. Tina Pickett joined legislative colleagues on Wednesday as Gov. 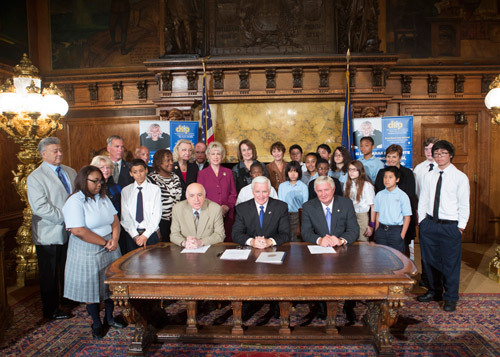 Tom Corbett signed House Bill 108 into law. The legislation continues the Children’s Health Insurance Program until 2015 and eliminated a six-month waiting period for new applicants.